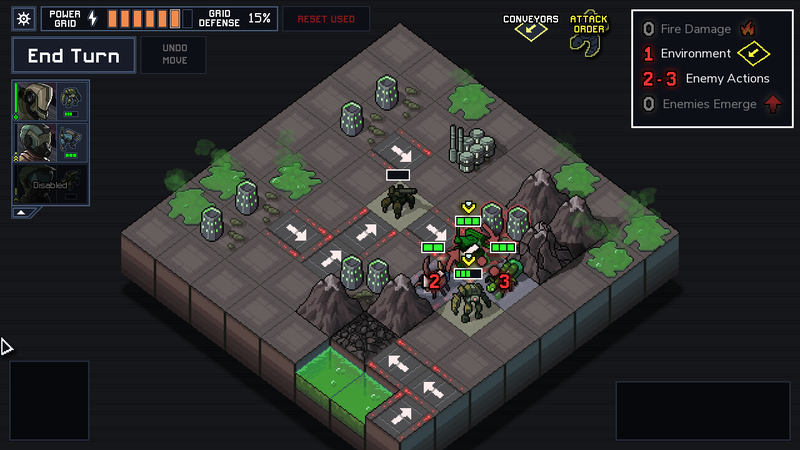 You should play Into The Breach, the brilliant new game from the makers of FTL. And if you are playing Into The Breach, here are some key tips that’ll help you get better at squashing aliens. Note: This article originally ran in February—we’ve bumped it up for the Switch launch of Into the Breach. I’ll assume you’ve already played a game or two to get familiar with the mechanics of fighting the Vek. These are advanced tips. Follow them and soon enough you’ll be clearing out aliens without missing a step. For example, in this round you can see enemy #1 going for one of my mechs, while enemies #2 and #3 are after a civilian building in the bottom right corner. So if I move that mech out of the way, I can use it to attack one of the other aliens and I’ve also negated Vek #1's attack, essentially getting two moves for the price of one. Vek #1 is just blasting air now. Many battles in Into The Breach will pit you against four, five, or even six aliens at a time, which means you won’t be able to thwart them all in a single round. That’s why it’s important to immediately recognize which ones are going after the highest-priority targets, and neutralize those attackers first. You don’t want any of your mechs to die—that could cost you a pilot—but all of their health will regenerate at the end of each battle. Your power grid—aka, your overall life bar for each campaign—will not regenerate at the end of each battle. So the math here is simple. Always, always let your mechs take hits instead of buildings. When you start using artillery blasts to knock aliens around the battlefield, you need to be sure you’re doing everything in the right order, or else you can find yourself doing more harm than good. Especially once you start playing around with more complicated squads—the ones that rely upon freezing and shocking, or using shields to protect your mechs and buildings—it’s important to plot out each turn before you move a single unit. When you’re plotting out a strategy for each round, remember that A) Vek aliens can hit each other and B) Vek aliens can block other Vek aliens from spawning. To master Into The Breach at its highest levels, don’t just think about how your mechs can do damage to aliens. Think about how you can move the aliens to positions where they do damage to one another. Now he’s attacking nothing and blocking an enemy from spawning, which will also damage him. Follow those tips and soon enough you’ll be a kaiju chess master, just like Guillermo del Toro.